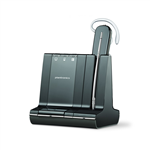 The Plantronics Savi® 700 series headsets let you move around the office and take calls from your desk phone, computer and mobile phone. 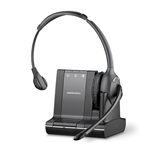 The Savi 700 Series headsets are optimized for Unified Communications. The Savi 700 series replaces the Plantronics Savi Office series headsets (WO100, WO101, WO200, WO201, WO300, and WO350) and includes the W745, W740, W740-M, W730, W730-M, W720 and W710 (M indicated the headset is Microsoft optimized). Enjoy wireless freedom while seamlessly managing PC, mobile and desk phone calls with a single intelligent headset system. Enjoy wireless freedom while seamlessly managing PC, mobile and desk phone calls with a single intelligent headset system. The Savi 710 over-the-head, mono-speaker, wireless headset has three-way connectivity (desk, computer and mobile) and is UC ready. The Savi 730 over-the-ear wireless headset has three-way connectivity (desk, computer and mobile) and is UC ready. The Savi 730-M over-the-ear wireless headset has three-way connectivity (desk, computer and mobile) and is UC ready. It is also optimized for Microsoft Lync 2010 and OCS 2007. The Savi 740 convertible headset has three-way connectivity (desk, computer and mobile) and is UC ready. The Savi 740-M convertible headset has three-way connectivity (desk, computer and mobile) and is UC ready. It is also optimized for Microsoft Lync 2010 and OCS 2007. The Savi 720 over-the-head, duo-speaker, wireless headset has three-way connectivity (desk, computer and mobile) and is UC ready. The Savi 745 convertible headset has three-way connectivity (desk, computer and mobile), is UC ready, and comes with a deluxe charging cradle for unlimited talk-time.